American food, professional service and a retro-modern setting. 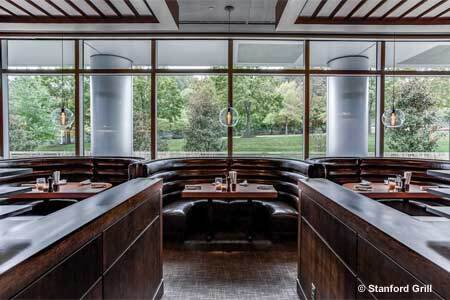 : Stanford Grill has a sparkling, high-end setting, and the menu is extensive, covering a wide range of contemporary American fare that demonstrates the inclusive nature of America itself. At lunch, Italian meatballs and sushi rolls are among the appetizers, Thai beef salad and grilled Scottish salmon are entrées, along with that all-American favorite, the cheeseburger, and the unusual crispy chicken sandwich of breaded fried chicken and kale on a house-made bun. As for a main-course salad, consider the unique Bravo version with chicken, avocado, goat cheese and roasted corn. Dinner presents many of the same elements, and brunch selections take patrons from chicken and waffles to a breakfast burrito. Desserts are a must, such as the wedge of Key lime pie topped with a mound of whipped cream stiffened with tapioca. For tipplers, there is a glass-encased and visible wine collection plus an extensive wine list. Waitstaff and service are first-class, and the environs conducive to a peaceful repast. There is parking validation in the basement garage.